The race started at a little after 10:15AM. When I was crossing the Verrazano Narrows Bridge from Staten Island to Brooklyn, I could see the skyline of Manhattan. The wind was a little strong, but it did not bother me. Running through Brooklyn and Queens was not too tough. The energy was great and I enjoyed the sideline performers at every mile. As I high-fived many kids and often received candies and chocolates from them, I thought I could run forever. But things changed a little when I was crossing the Queensboro Bridge. Suddenly all the cheers stopped, and the only things I could hear were the howling of the wind, the runners’ heavy breathing, and my rapid heartbeat. Under the shadows, the wind gradually took my body temperature away, and I was desperately trying to fight my way off of the gloomy everlasting bridge. Without a doubt, it was one of the toughest moments for me throughout the course. As I kept running towards the end of the bridge, I saw a light at the entrance to 59th Street. It was small in the beginning, but the moment I stepped into Manhattan, the air of excitement from the spectators struck me one by one like continuous heat waves. I stored my energy and ran north along First Avenue. Some of my close friends told me to expect them around 96th Street. When I finally saw those familiar faces holding huge posters and cheering for me, I was pretty much speechless. We had a big hug and I quickly started to run again, onward to the Bronx. It had been about twenty miles from the starting line when I hit the Bronx, and I noticed that more and more people started to walk. Still, I tried not to focus on them and maintained my motivation. By the time I arrived back in Manhattan again, I felt like I could easily stop at any time. Although there were just about five more miles to go, my lungs were in pain, my ankles were getting tight, and my toenails were probably bleeding. The last several miles along Central Park made me feel as though I was running the victory road to the greatest triumph in the world. Inside, I was having the most severe combat with my own willpower. “If I could keep running, I win; if I stop, I lose,” I thought. Everything was pretty vague during the last few miles, but I do remember the last mile as if it just happened a minute ago. Multiple waves of goose bumps hit me when I began to see a series of flags waving in the air near the finish line: it was indeed a victorious moment. Those early morning runs, numerous struggles, and hectic trainings paid off. When I crossed the finish line, I thought I won: I proved something, not to anyone else but to myself. The entire race was a competition against myself after all, and I definitely felt that I had won. I once thought running a marathon was something I would never do, if not impossible. Running a 3K race back then was quite a challenge; but then, there were those moments when I did my first 5K, 10K, and then a half marathon. After completing the 26.2-miles, I must say that the journey was not easy. Determination to challenge my limits, perseverance to endure the pain, and a little bit of courage and cheers from friends and family along my endeavor have made me run thus far. New York City embraces the most incredible people and provides such an opportunity to encounter the richest cultural diversity. Running across the city reminded me of that once again. Every spectator and volunteer I met gave me the feeling of acceptance and benevolence. That is a feeling I want to hold onto and, for that reason, I will run the marathon again next year. 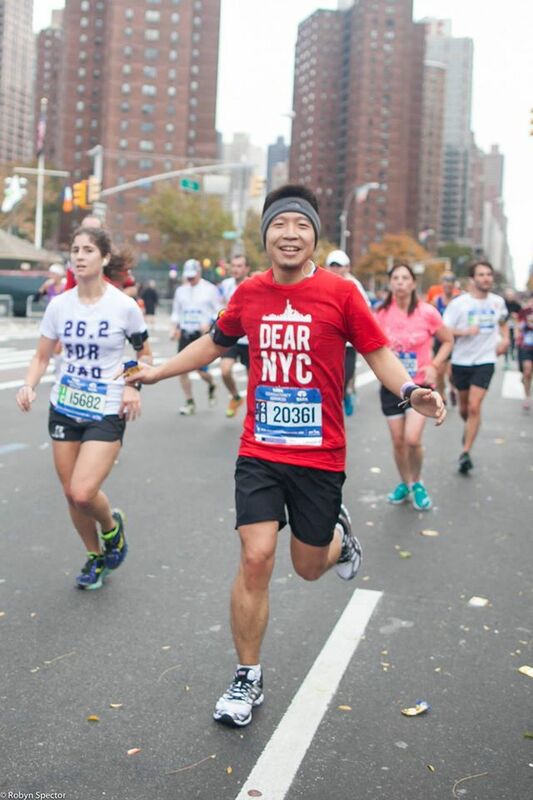 Several people have asked me why I ran the New York City Marathon. Why? Because I wanted to know my maximum potential. Because I wanted to feel the excitement. And most of all, because I love New York.